A force of soldiers and animals is assembled, so massive it shakes the earth when they march -- an army, beyond what man had yet to conceive or even imagine in his dreams-- marches to devour Greece, led by Xerxes himself, to snuff out the world's one hope for reason and justice. Only three hundred brave souls stand in its path. As Xerxes will painfully find, they are more than men, they are Spartans. Working closely from the source material- the amazing graphic novel 300 and with direct consultation with Frank Miller we proudly introduce the shield of Sparta as he envisioned it. Made from the finest authentic materials this incredible shield is made of steel and plated with antiqued brass, is fully lined on the inside and features the traditional hand holds. Includes certificate of authenticity featuring the stunning work of Frank Miller. 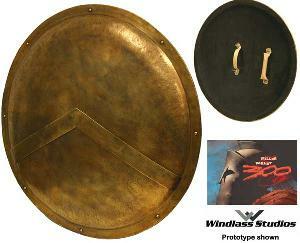 The shield is a full 36” and weighs approx. 17 ½ lbs. Protect yourself and your brother next to you, because this is Sparta! Officially licensed product from the graphic novel.